Footage taken by a drone that led to the rescue of a Scots climber in the Himalayas has been released. Aberdeen-born Rick Allen, a highly experienced mountaineer based in Aboyne, was in the region with climbing partner Sandy Allan, from Newtonmore. 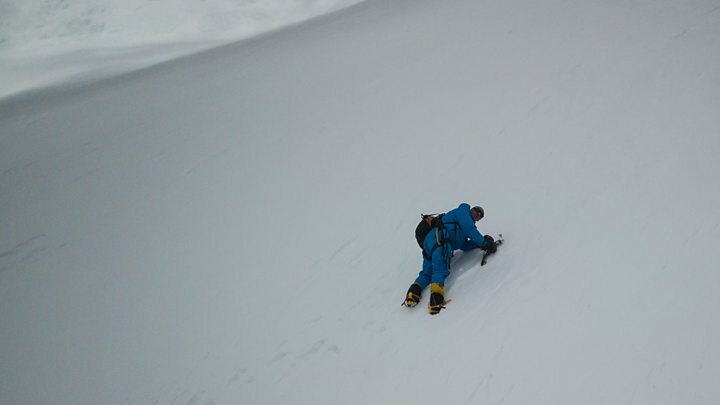 Mr Allen was returning from a solo climb to the summit of 8,047m (26,401ft) Broad Peak when he fell. He was knocked unconscious and also suffered cuts and frostbite during his ordeal. A base camp cook saw his rucksack high on the mountainside as the climber attempted to make his own way down off the mountain, 36 hours after his ordeal began. The drone was used to confirm that it was Mr Allen, and then direct Sherpas and climbers to where he was to help him to safety. The drone's operator was Polish climber Bartek Bargiel, who is in the Himalayas to film his older brother Andrzej attempt to ski down K2 when the drama unfolded earlier this month. Mr Allen, who is now back in Scotland, praised the actions of the brothers, describing them as "smart, young guys". The drone footage was released by the Polish brothers with Mr Allen's blessing.